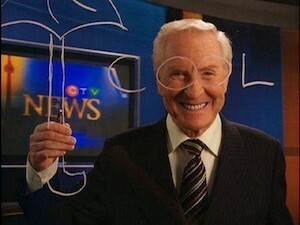 CFTO’s Dave Devall and his signature umbrella and glasses doodle. Before I got into podcasting, I spent the first decade of my career working in television. My very first job was at CFTO in Toronto. The 6pm CFTO newscast absolutely dominated the market there. Everyone in Toronto knew the anchor team of Tom Gibney and Christine Bentley, the weather legend Dave Devall, and sportscaster, Lance Brown. All the other stations in town had CFTO in their sights. Every year or two, one competitor would reformat their news in an attempt to topple the mighty CFTO news. It never worked. Years later, I was part of the start-up team at brand new TV station in Vancouver called… Vancouver Television (VTV). 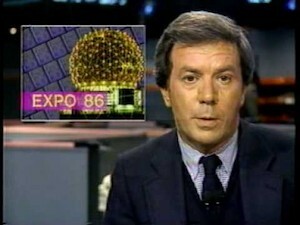 The goal was to shake-up a market that was dominated by the BCTV Newshour and their iconic news anchor, Tony Parsons. Despite some truly creative thinking, top talent, and fantastic local storytelling… it didn’t work. BCTV news legend, Tony Parsons. Then, several years after THAT, I spent some time in the local newsroom at Citytv Vancouver, where they were re-vamping the local news in an attempt to unseat… BCTV Newshour and their iconic anchor, Tony Parsons. Surprise, surprise… it didn’t work. NONE of it worked. No one could unseat CFTO in Toronto or BCTV in Vancouver. Why not? CFTO and BCTV were consistent over time. And the result of “drip by drip” is that viewers got to know the anchors and reporters. Viewers got to trust the anchors and reporters. Viewers felt that the anchors and reporters were like family. And watching the local news with those journalists became a deep habit. Too many times, I’ve been part of media companies where the expectation is to launch a new show or a new format and instantly “win.” The problem is that you can almost never instantly win at anything. In fact, many of the ideas behind those new shows or formats were really smart, strategic and compelling. The problem wasn’t necessarily the content, the format, or the people — the problem was that they gave up too soon. If you’re making content and the goal is a long-term trusted relationship, consistency over time is quite possibly the most neglected route to success. Too often, if there aren’t results within a year, a new project is deemed a failure. And so it is reinvented yet again. And again. And the cycle continues. So why is a podcaster talking about local TV news? Podcasts are no different. Dan Misener recently wrote this piece about how the most popular podcasts have been publishing episodes for a long time. He did a deep data-dive and discovered that “the top 100 most-played shows in Castbox have a median episode count of 203.5,” while half of all podcasts have fewer than 14 episodes. Has This American Life changed dramatically over time? Has The Joe Rogan Experience reinvented itself every year? Has Freakonomics changed hosts to try to grow their audience? They’ve delivered the goods, episode after episode, seasons after season, year after year. And now people know and love the hosts, they trust the hosts, and they’ve created deep and regular listening habits.